An interesting thing I found out today was the fact that Microsoftâ€™s Laptop Hunter ads have got so effective that Appleâ€™s lawyers have begged Microsoft to stop running them. And this information was shared by non other than Microsoftâ€™s Chief Operating Officer Kevin Turner said during his Worldwide Partner Conference Keynote in New Orleans. Apple clearly has been affected by the latest Laptop Hunters and Rookies ad campaigns. They are cutting prices, revising designs and even trying out a couple of new Get a Mac commercials, which still donâ€™t get the job done. Now let’s talk about Apple. What are you going to do about those Apple ads? That was a year ago. Gosh, when I went home for the holidays, brothers, sisters, cousins — hey, hope you don’t have anything to do with marketing over there at Microsoft. 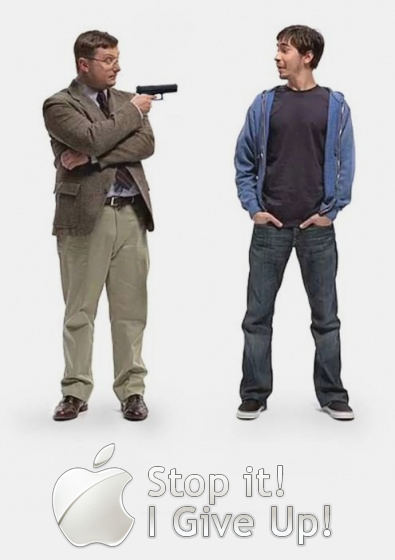 What are you guys going to do about those Apple ads? Stay tuned, stay tuned, stay tuned. Wow. Did we punch right back? The PC Hunter ads, the PC Rookie ads clearly have been winners in the marketplace. I pulled this out of my Sunday newspaper. I have an old habit because I came from retail looking at the Sunday tabs and circulars that are in newspapers. This is straight out of my paper last Sunday. This is a comparison out of a leading electronics retailer that you can get a 13.3-inch Macbook for US$1199 from that retailer. Guess what. That same retailer, you can get the same PC with more RAM, a bigger hard drive, and almost a three-inch bigger screen for US$649. What an incredible opportunity. And so we’ve been running these PC value ads. Just giving people saying, hey, what are you looking to spend? â€œOh, I’m looking to spend less than $1,000.â€ Well we’ll give you $1,000. Go in and look and see what you can buy. And they come out and they just show them. Those are completely unscripted commercials. I did cartwheels down the hallway. At first I said, “Is this a joke? Who are you?” Not understanding what an opportunity. And so we’re just going to keep running them and running them and running them. This is out of last Sunday’s paper, the Apple tax. It’s getting out. And when we put Windows 7 in there, which we’ve got coming out in October, what an incredible opportunity for us to fight back. And it feels really good to be on the offensive here. And we know we’ve got plenty of work to do. We don’t have it all figured out. But I want you to know, ladies and gentlemen, we’re doing stuff and we’re in the game and continuing to take some of these hard market share opportunities head on and compete because it’s a test of will, as I said. There is a clear shift in market trends towards Microsoft, and they are determined to continue the assault on Apple by opening their new chain of Microsoft Stores in the vicinity of Appleâ€™s. What ever this war may bring for the computing giants, it would only be a win-win situation for us consumers. Ran 14 queries in 0.168 seconds.